Stunning handmade glass wall clock. 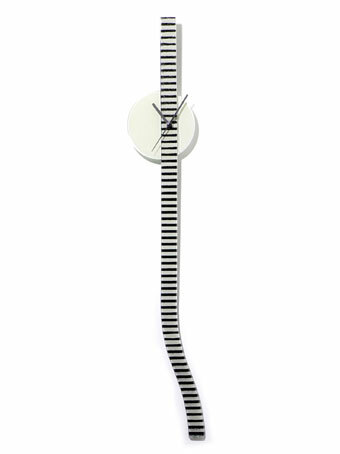 Set with a round creamy white glass face with a slim glass drop with a retro curve at the bottom. The glass here lies on top and within the round glass face and is set with glass fused with white horizontal stripes from the front and a striking black applied to the back resulting in a very eye catching design indeed. Width of the clock face is 13cm and length is a long 80cm. This clock is induvidual and handmade so is sure to draw comments from everyone who sees it!